You will be able to spend your time enjoying beautiful nature and interacting with animals. If you are someone who was a get away from the city then this is going to be the perfect adventure for you. You will get a real up-close experience with animals and it is the perfect activity to do with that special someone. You will spend three hours relaxing with some of the friendliest creatures on the planet. Not only will you be in beautiful crystal clear Bluewater but you will get to enjoy a relaxing time in a nice and warm climate. You will enjoy time in the backcountry and see this place on another level. 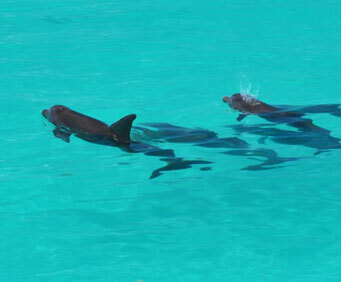 You will hop aboard a nice comfortable boat and go out for a snorkeling cruise and dolphin watch. If you want to get out of the house and into nature then this is the perfect time for you. If you like peaceful calm waters that are beautiful to look at and fun to hang around in then you will love the Gulf of Mexico. This is the perfect opportunity for you to spend the time away from everything with just you and nature. If you are lucky you will get to interact with Dolphins and you don't have to be an expert swimmer to enjoy this experience either. The crew will be helping you every step of the way because this experience while does not require expertise it will be important for you to have some understanding of your mask and other equipment. After you spend your day out in the sun enjoying nature then you will spend the rest of it enjoying a cold beer or wine and relax. Get in touch with one of nature's friendliest mammals on this relaxing 3-hour dolphin cruise from Key West. Sail alongside playful dolphins and take in the spectacular scenery before enjoying a snorkel trip through the Florida Keys' backcountry waters. Explore the underwater world and discover a variety of vibrant tropical fish. Hop aboard and travel through the beautiful Key West backcountry for a dolphin watch and snorkel cruise. Get an up-close look at playful dolphins in their natural habitat as you cruise through pristine waters and admire the magnificent scenery. Then, head out for a snorkeling adventure! Explore the underwater world as you swim in the warm, serene, shallow waters of the Gulf of Mexico. See sponges, coral, tropical fish and more. You don't have to be an expert swimmer, because the crew will provide you with guidance and top-of-the-line gear including mask, fins, snorkel and a float if you wish. After a day on and in the water among nature's most stunning gifts, you'll begin our ride back to dock. Enjoy complimentary cold beer and chilled wine.